Location: Banff and Buchan, Aberdeenshire, Scotland. 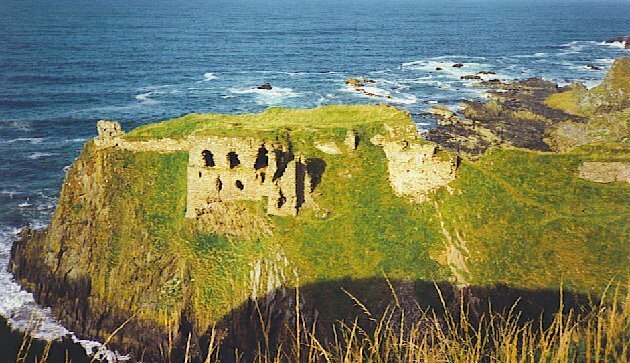 Notes: Findlater Castle sits in a romantic position on a 50-foot (15 m) high cliff overlooking the Moray Firth on the coast of Banff and Buchan, Aberdeenshire, Scotland. It lies about 15 km (9.3 mi) west of Banff, near the village of Sandend, between Cullen and Portsoy. The cliffs here contain quartz; the name "Findlater" is derived not from Norse as earlier stated here, but from the Scots Gaelic words fionn ("white") and leitir ("cliff or steep slope"). The first historical reference to the castle is from 1246. King Alexander III of Scotland repaired this castle in the 1260s in preparation for an invasion by King Haakon IV of Norway. The Vikings took and held the castle for some time. The castle remains that are still there are from the 14th-century rebuilding, when the castle was redesigned based on the Roslyn Castle model.